Nesting. It’s what birds do, and wasps, too. As I’ve learned, expectant human mothers do it as well. “Nesting” is a mother’s primal instinct to settle into a new home and prepare a cozy place for a baby. For my wife, Shanna, this provided a good excuse to convert a spare room into a nursery. Like decorating a doll house on a real-world scale, Shanna had the nursery’s interior design down to a science, with a keen attention to detail that I genetically lack. She resolved that the visual theme for the room would be “sheep.” (Hey, don’t ask me.) The color palette: grayish brown, tan and baby blue. These tones probably go by a fancy manufacturer’s moniker like “Autumn Essence” or some goofy thing that most guys feel silly saying out loud, so I’m using layman’s terms here. 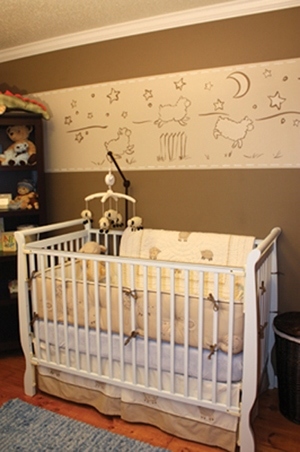 The walls were already painted brown, so she wanted a broad tan border surrounding the room, located just above the crib and wide enough to provide a color frame for some “sheep” decals, as well as some photography along the adjacent walls. She came up with the grand plan, and I got roped into painting it. On the border, it’s like the Wild West. There are no hard rules for a wall border’s size, color or style. In our case, we wanted our border very pronounced and wide enough to surround some picture frames. However, smaller “chair-rail” style borders are also popular for many interiors. When locating the upper and lower edges of the border, be mindful of the various obstacles around the room such as door and window casings. At these wall transitions, you’ll need to decide if it looks better to align the edges with the existing visual breaks in the room, or to allow a few inches of reveal around casings, shelves, switchplates, etc. Locate the border edges and use a level to mark the edge lines around the room. When locating the upper and lower edges of the border, be mindful of the various obstacles around the room such as door and window casings. 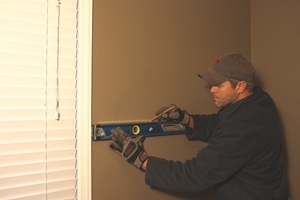 Locate the edges along the wall and, using a 4-foot level and a pencil, mark horizontal lines around the room. It’s nice to have an assistant lend a hand while doing this. 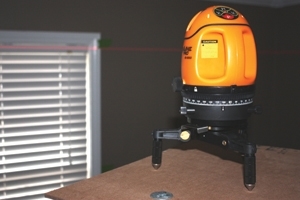 Another alternative is to use a laser level, some of which can project level guidelines completely around the room while freeing your hands to mark the layout. 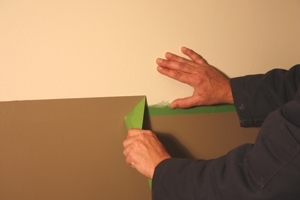 Press the tape firmly against the wall for the best adhesion. 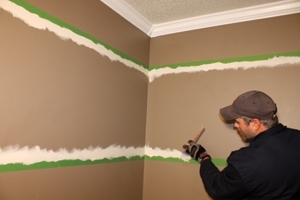 Carefully mask the lines with painter’s tape. Next, line the pencil guidelines with painter’s tape. Choose a quality tape for masking the paint. In this case I chose Frog Tape, which creates a chemical seal when it comes in contact with latex paint. 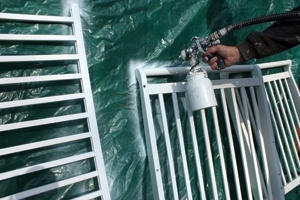 A good paint seal is absolutely critical to achieving a pro-quality border with crisp, clean edges. For the best seal, I ran a rubber roller over the masking tape to press it firmly against the wall so the backing adhesive makes full contact along the tape edges. 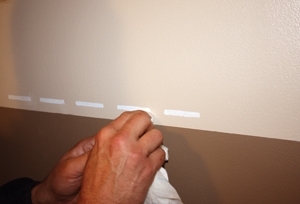 The first step of painting is to cut in the edges along the tape with a brush. When painting the edges, brush away from the tape and into the border. 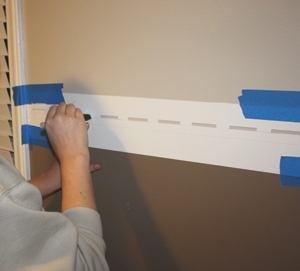 Avoid making brush strokes toward the masking tape, which might lift the tape or force paint beneath the edge. 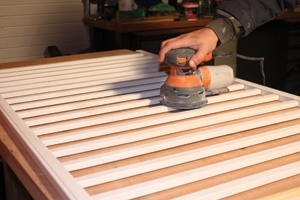 Complete the field of the border using a roller. Cut in the edges along the border by moving the brush strokes away from the tape. 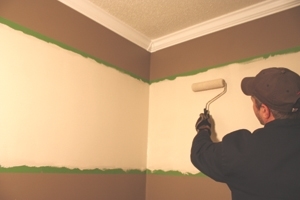 Complete the field of the border with two or three coats of quality latex paint using a standard paint roller for an even finish and to avoid bristle marks on the wall. Narrow borders may be rolled with a smaller 4-inch roller, but for any stripes smaller than that, you’ll be stuck using a brush. The selection of paint finish may also be a consideration for the border. For example, the brownish wall paint had a satin finish. 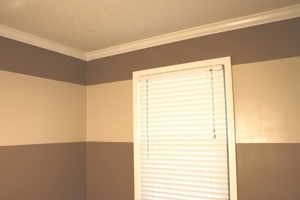 For the tan border paint we selected a semi-gloss finish to provide a subtle contrast from its surroundings. 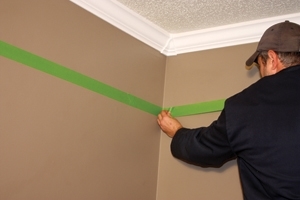 Careful taping, painting and scoring will achieve a crisp paint line. Score the dried paint before removing the tape. 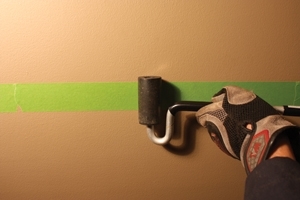 To help ensure a faultless paint line, carefully score the paint along the tape seam using a sharp utility knife after the border paint has completely dried. It may help to use a straight edge to guide the blade. If you remove the tape without first cutting the seam, it risks peeling the paint along the edge. 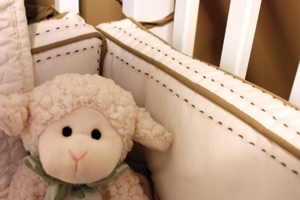 Here is the inspiration for the nursery decor: the sheep theme, along with the quilted stitching that was used as a pattern for the border detail. Shown is the border before the stitching detail is added. The final touch to our border design came from the creative mind of my wife. Like I mentioned, “sheep” was the visual motif of the room, and she had purchased quilting for the nursery crib featuring the requisite barn animals along with some decorative stitching. Her idea was to accent our border with two miniature borders that would line the inside edges of our big tan stripe. These mini borders were intended to look like two baby-blue broken lines, sort of a series of dashes that were meant to mimic the stitching pattern on the sheep quilt and complement the color scheme common throughout the room. Cool idea. After leveling the template and taping it in place, we used a detail brush to paint the small stitching accents. We created the template for our stitching detail using poster board and a razor. Rather than haphazardly slathering a narrow brush over the wall to make our dash marks, we wanted to keep our pattern orderly, regular and repeating—if a little imperfect—because we wanted this detail to give the impression of hand-sewn stitching. Our solution was to cut a template of the “stitching line” from poster-board, leveling and taping it in sequence along the inside edges of our border and using a detail brush to dab in the baby-blue highlights. 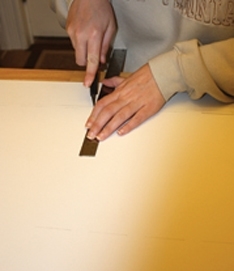 If you use any sort of template to add detail to your border, keep a damp cloth handy to catch the inevitable drips and dollops of paint that sneak behind the poster board. My wife added the peel-and-stick decals as a playful touch above the crib. When using a template, keep a damp rag handy to catch the inevitable paint runs. The final step of our border design couldn’t have been simpler. 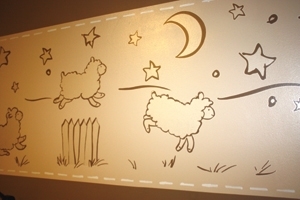 On a recent shopping venture, Shanna had discovered some peel-and-stick wall decals—sheep, of course— that she simply “had to have.” Her application of the stickers gave the nursery wall a final, playful touch and put a ribbon on our paint project. Interior design is not my strong suit, so it’s nice to have a wife with an eye for style. Once completed, the border both enhanced and brightened the room. The earth tones blended well with the creams and baby blues, and I was satisfied that her design scheme nailed the right balance of cuteness and boyishness for my new son. And in the end, I’m even okay with the sheep theme for his room. Heck, it beats unicorns. My job wasn’t over once the border was complete; just ask my wife. How could our nursery have a crib that didn’t precisely match the color scheme? What is this, the third world? Back in the workshop, I disassembled the heirloom infant crib, which had a perfectly satisfactory factory-white paint job, to repaint it the same ghost-pale baby blue that we used for the stitching pattern on our nursery room border. 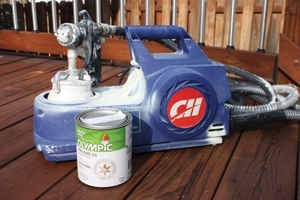 This required scuff-sanding the entire wood surface with an orbital or block sander—every edge, nook and cranny. I didn’t completely remove the old paint but did sufficiently abrade the surface for better adhesion of the new paint job. I then wiped away all the dust so the new color would stick well. Since the paint was being applied to an infant’s crib, we purchased some zero-VOC Olympic paint at our local Lowe’s (www.lowes.com). Traditional paints contain VOCs (volatile organic compounds) that can lead to indoor air pollution, the formation of smog and other nasty stuff. For the health of the baby, we wanted to play it safe. Given all the pickets, bars and tricky shapes of the crib, I decided to paint it with an HVLP sprayer in my backyard after masking off the surroundings with plastic sheeting. It took a few coats and a good deal of patience, but the sprayer achieved a beautiful, super-smooth finish. The end result was a smart, subtle color change that helped tie the room’s interior design into a collective whole. Laser levels can be pricey, but they also provide a hands-free method of determining your border layout. Plus, you only have to calibrate them once to set the lines in a room. Shown in this photo, the Johnson Acculine Pro Laser is a self-leveling device that projects horizontal and vertical laser layout lines along the walls and ceiling for easy visual reference when planning a wide variety of projects. www.johnsonlevel.com.